As I mentioned in last weeks post, I am participating in Amy Johnson Crow's #52ancestors in 52 weeks challenge. This challenge provides weekly prompts to get us to think about our ancestors and share something about them, with the purpose of getting that knowledge out of our heads / filing cabinets / genealogy software and doing something with it. If you are a user of social media, check out the #52ancestors hashtag to follow along and read some of the really amazing stories that have already been shared. 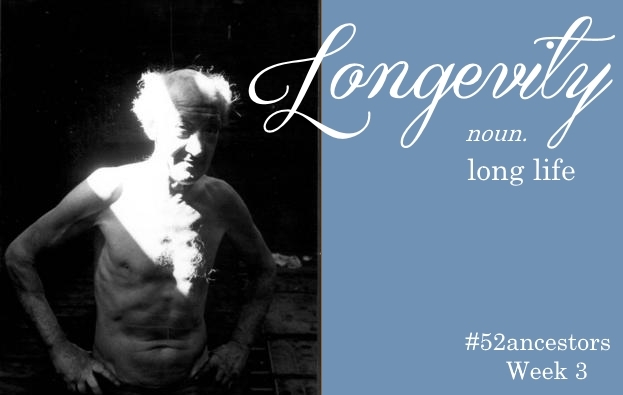 This week's prompt is 'longevity.' As soon as I read this, I knew whose story I would share; that of Mr. John Shannahan, my fourth great-granduncle, who lived to be an amazing 98 years old, in a time when the average life expectancy for a male was around 43 years. I only recently began delving into the life of John Shannahan, in the hopes that I would find out more information about his sister, Ellen (my 4x great grandmother) whom I know nothing about - other than she married my 4x great grandfather, Thomas Quigley in Ireland. I came across John's name in the records of my 3x great grandfather Michael Quigley, when he migrated to Australia aboard the Jessie Munn. Michael arrived in Geelong on 9 November 1857 and according to the ship's dispersal log, he went to his uncle, John Shannahan, in Cowie's Creek. Finding this information excited me for several reasons, firstly as a complete and self-confessed genealogy nerd, I was happy that I had found the right person, and these documents supported the connection. And secondly, I had found another person to research, especially one that was connected to an even earlier direct ancestor. John lived an amazing life, as you can expect from someone who lived for almost a century. He was quite old (compared to some) when he came to Australia, probably around the early to mid 1840s, and either landed in or made his way to Geelong. Unfortunately, I don't yet know anything about John's life prior to Australia - he may have had a family, he may have left his family or travelled with them. These facts are still being investigated however some of John's story has been shared by historian Ray Watson in his publication Stories from a Starry Summer Night. After John Batman and Co. moored the Enterprise in Port Phillip Bay in 1835, more squatters began to arrive, quickly moving further and further west, displacing the indigenous Wadawurrung peoples from the area. John Cowie, a saddler from Scotland, was one of the earliest settlers in the area, and thus Cowie's Creek was so named. The creek was primarily used for landing stores and shipping out wool as the creek meanders from Moorabool farming area to the mouth at Corio Bay. 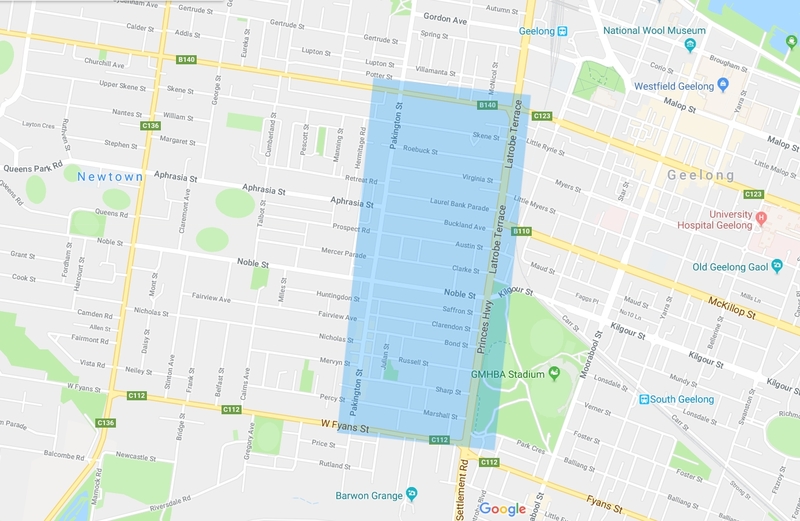 The area surely and steadily grew, and by the end of the 1840s, there was about 8000 people living in Geelong. On 16 April 1849, John married a young woman named Margaret Patten, who was 19 years old. Margaret had travelled to Australia the year prior as an orphan of the Potato Famine in Ireland. She was a housemaid, employed by Denis Costigan for six months, for the wage of £12. Their marriage was witnessed by Catherine and James Doran, who were pioneers in their own right. Catherine's maiden name was Shannahan but her relationship to John is obscure at this point - she may have been his much younger sister or his daughter, his niece or his cousin. At the time of their marriage, John and Margaret Shannahan were living in Irish Town - now known as Chilwell in Geelong, located between Pakington Street and La Trobe Terrace. Irish Town had a population of about 135 in 1846, and was presumably (and probably somewhat derogatorily) so named due to its high numbers of Irish immigrants. When John and Margaret were living there three years later, the numbers had undoubtedly increased, and in such a small area, living quarters may have been a bit cramped. 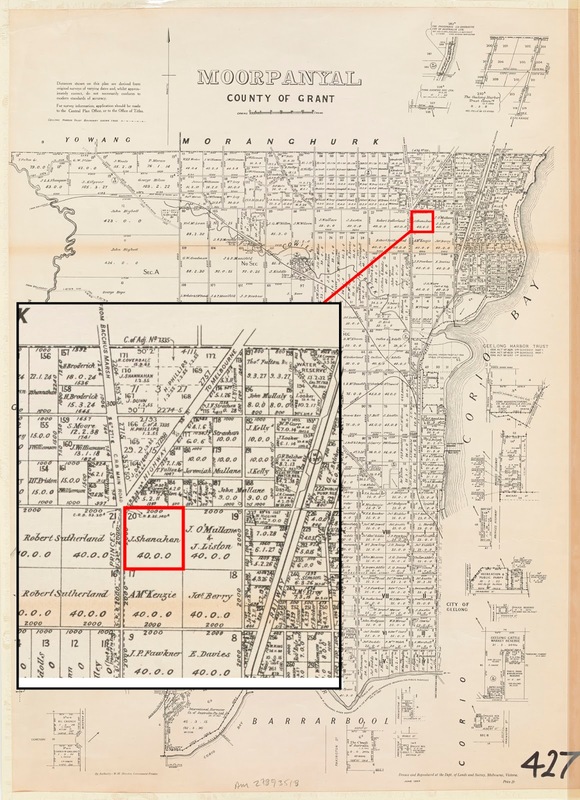 On Wednesday, 27 June 1849 a public sale of land in Geelong took place, at the auction rooms of Messrs., Tennent and Co. Apparently the "...attendance of bidders was very numerous, and throughout the day's proceedings a strong spirit of competition was exhibited. The auctioneer did not sell more than the first 58 lots, as it was found impossible, in one day, to go through the entire quantity offered for competition" [source: The Argus, 28/06/1849, p.2]. Amongst the many numerous attendees was John Shannahan, who acquired 40 acres of land in the parish of Moorpanyal, at Cowie's Creek, near Geelong for £86. 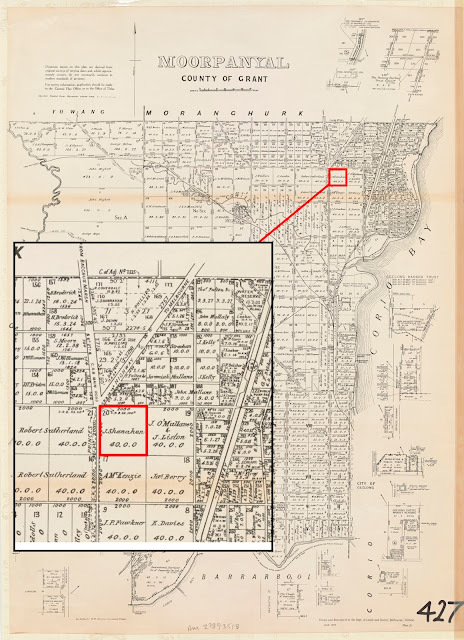 Lot of land purchased by J. Shanahan. Map of Moorpanyal, County Grant, drawn and reproduced by the Dept. 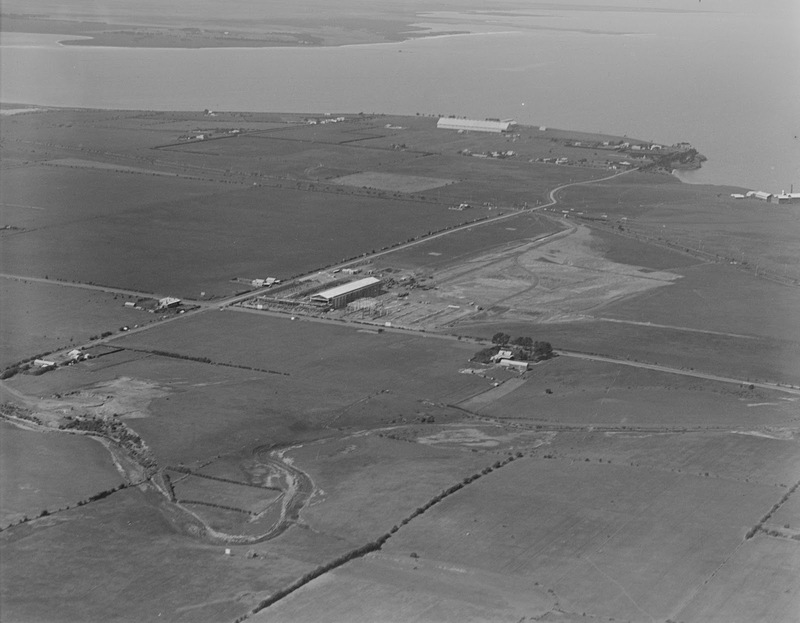 of Lands and Surveys, Melbourne, Victoria, 1953. John and Margaret would build a 4 room stone house on their property, near the junction of the Melbourne and Bacchus Marsh Roads, which they would farm throughout their lives and raise their family of 11 children including John Francis (1850), Dennis Joseph (1851), Catherine Mary (1853), Michael (1853), Thomas James (1855), James Francis (1856), Edward (1858), Margaret (1865), George (1866) and Patrick Shannahan. I'm still investigating the names and precise dates of their children. On 19 April 1859, Hugh Hunt from the Toll Bar Hotel in Batesford - a small township located approximately 10 kilometers from Geelong - placed a notice in the Geelong Advertiser for John Shannahan. He indicated that John had seven days to come and pay his bill or the blacksmiths' tools he left would be sold as recompense. On Wednesday 26 October 1864, John appeared before the Central Police Court made up of the Police Magistrate, Dr. Day, and Messers J.R. Morris, G. Brown and F. Champion, accusing Thomas McLoughlin of assaulting him. Apparently McLoughlin had gone to put a horse off the right-of-way on which Shannahan had tethered it, when "words arose and blows ensued." John swore that McLoughlin struck him first, and of course, the defendant swore the reverse. From the evidence presented to the Police Court, McLoughlin fought with a piece of quartering (which is I believe a piece of wood), and Shannahan with his hoe-handle which was not very long but long enough to cut the stick of McLoughlin. The bench ruled in favour of John and ordered the defendant to pay a fine of 5s (shillings) and compensation of 5s [source: Geelong Advertiser, 27/10/1864, p.3]. It's evident from this occurrence, John certainly was a lively ol' fella and continued to be so. At the spry old age of 98, John was apparently quite active and "...in full possession of his faculties..." up until the time of his death. He was a very familiar figure in Geelong, often in the habit of mounting a horse unaided and riding all over the district. It was commented in a local newspaper upon his death that his remarkable activity and good horsemanship often excited the wonder of visitors to the district [source: The Ballarat Star, 15/05/1902, p.1 and Geelong Advertiser, 13/05/1902, p.2]. 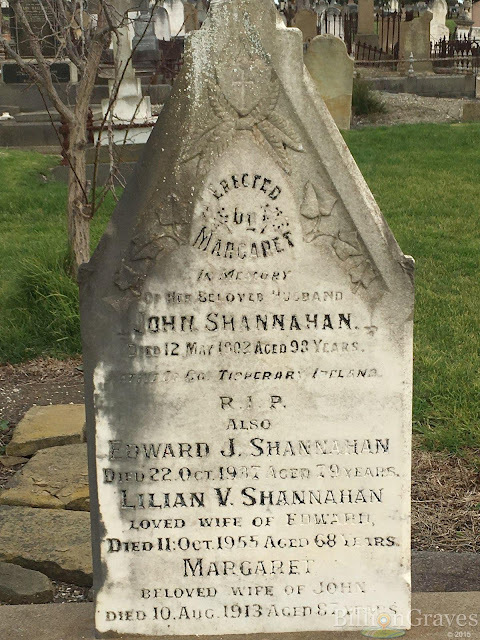 John Shannahan passed away on 12 May 1902 after a brief illness and was buried in the Geelong Eastern Cemetery. All of his estate was bequeathed to his wife, Margaret, which totalled £380 including about 38 acres of land and their 4 room stone house, and a personal estate of £99 which included a single furrow plough (an instrument used for irrigating soil, usually pulled by a horse), harrows and drag harrows (used for breaking up and smoothing soil), 2 old buggy horses, a cow, an old buggy, harnesses, furniture and whopping 25 tons of hay. John was definitely a memorable figure - his name synonymous with the Cowie's Creek district even decades later. His family continued their farming pursuits in the district, until the property boom in the 1920s when they sold most of their land. John's humble 40 acres near the junction of Melbourne and Bacchus Marsh Roads was built upon in 1925 and became Ford's first Australian motor-car plant. Please do stay tuned for more information on John and his family as it becomes available to me. For a man who lived for almost a century, there has to be a treasure trove of stories just waiting to be discovered! My connection to John Shannahan, my 4x Great Granduncle. A great story and so well told! Thank you. Hi Helen, thank you so much for reading and commenting. I'm glad you enjoyed it. So much great information can be found through Trove. Here in Tasmania we also have the website 'TheList' which gives great information on land grants and properties. Is there a similar website for Victoria? I have to say, I love Trove as a source of information - its one of my go-to research sites. I've never heard of 'TheList' but I will have to look into it as my family came from Tassie prior to migrating to Victoria - convicts! I'm not aware of a similar website in Victoria, usually I just look into electoral rolls and rate books for property information. I will have to have a search and see if there is one. Thanks for reading and commenting. Hi Louise, I am a gg grand daughter of John Shannahan and Margaret Patten. I was thrilled to read your story and have info about John's children if you are interested. Can you please let me know the best way to contact you so we may share information? I look forward to hearing from you. Many thanks, Jenny. My apologies for not contacting you sooner as I haven't checked my blog lately. Please contact me via email LG_Creations@yahoo.com. 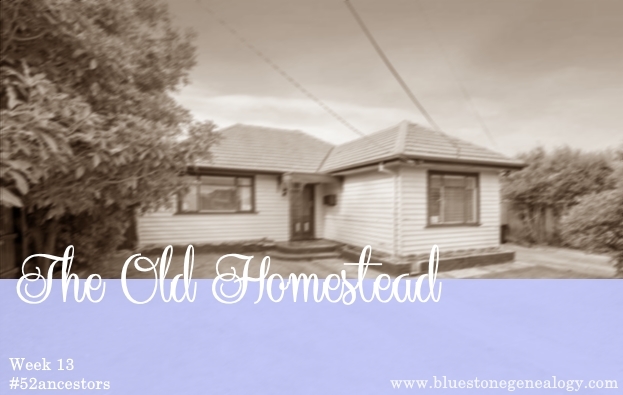 Week 13 of the #52ancestors challenge is "The Old Homestead." I contemplated talking about the history of Numbers 16 and 18 Glance Street in Newmarket which saw many Shorten's through their doors. I contemplated talking about the legacy of my late grandfather - our holiday house in the little hamlet of Loch Sport in Gippsland, Victoria. The first thing I thought of however, was talking a bit about the first home Nan and Pop built together in the 1950s in North Altona in Melbourne - the same home that my parents, sister and I lived in for the first eight years of my life - and a bit about their job as caretakers and cleaners of the Altona North Technical School. 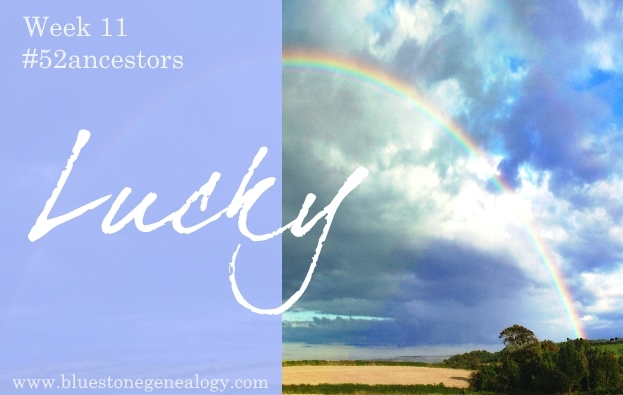 Amy Johnson Crow challenges us this week with the theme 'Lucky' in #52ancestors. What does it mean to be lucky? Dictionary.com defines it as having or being marked by good luck or fortune. For some this means only knowing success and prosperity, and for others it means a once in a lifetime opportunity. For my 3x Great Grandfather, Goymer Shorten who was a career criminal in Suffolk, England; being lucky meant he didn't hang for his crimes of horse theft! It may seem ridiculous by modern standards, but the theft of domestic animals including sheep, cattle, horses, pigs and fowl, was quite common in the nineteenth century. Horse theft was judged to be the most serious of these offences, considering prior to the industrial revolution, horses were the primary source of power for agriculture, trade, and transport. Given their importance for the successful continuation of industry and livelihood, it comes as no surprise that the penalty for horse theft was death. The subject for week 8 of the 2019 #52Ancestors in 52 Weeks Challenge, organised by genealogist Amy Johnson Crow, is 'Family Photo.' Of all of the family photos in my possession, the one I am about to share means the most to me - not only in terms of sentimentality, but in terms of historical significance. 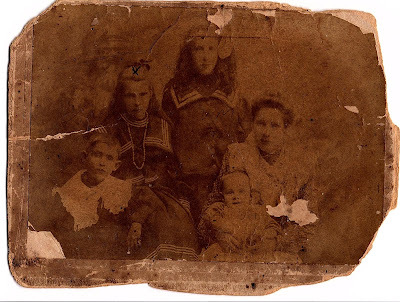 It is the oldest family heirloom in my possession, and the only image that I have of my great-great grandmother, and her children. This photo was originally in my Nan's possession, but since I am the (self-appointed) Family Historian, she passed it on to me for safe keeping. This photo was taken in mid to late 1906 which was a period of great hardship for this little family but, before we continue I strongly suggest reading my previous post 'Invite to Dinner' to give you some important contextual information. You can find the post here. I've been researching my family history for over fifteen years, with a strong focus on Victorian and Tasmanian connections. Professionally, I hold a Bachelor of Archaeology with Honours and a Post-Graduate Diploma of Museum Studies. I've been employed with Museums Victoria for the past nine years. Please note all creative writing featured on this website is protected under Creative Commons and should not be reproduced without the express permission and acknowledgement of the author.